Roulette Scratch Card Review - Casino Answers! 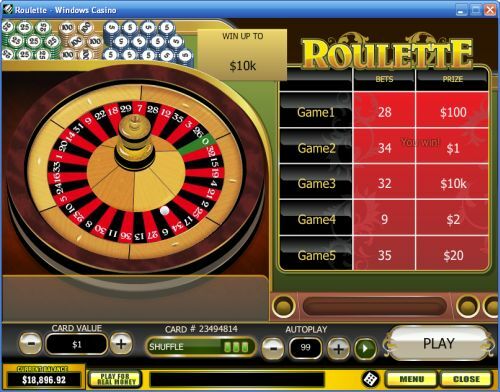 Roulette is an instant win scratch card developed by Playtech. You can play the Roulette online scratch card game at Bovada. The Roulette casino game is a dime scratch card. Bets on the Roulette scratch card are $0.10, $0.20, $0.30, $0.40, $0.50, $0.75, $1, $2, $3, $4, $5, $10, $15, $20, $25, $50, $75 and $100 per ticket. The Roulette scratchie has a very good betting range that should suit any scratch card player. To play the Roulette scratch ticket, select your bet and press the “Play” button. You can then either hit the “Scratch All” button to automatically scratch the entire card or you can scratch the wheel and the 5 games (or roulette bets). If your bet matches the number the roulette ball has landed on, you will win the prize listed to the right of your roulette bet. The highest payout on the Roulette scratch-off ticket is 10,000X your bet. By matching the number on the wheel that the ball landed on to one of your five game numbers with the top prize on it, you will win that prize. You can win up $1,000,000 playing the Roulette scratch card at Bovada! The Roulette instant win lottery ticket has a basic autoplay mode. Use the “+” and “-” buttons under “Autoplay” to select from 1-99 autoplay games of the Roulette scratch card. To start the autoplay mode on Roulette, simply press the Play button. Press the Stop button to stop the Roulette scratch card autoplay feature at any time. The Roulette scratch card gives players five chances to match one of their numbers to the number of the roulette wheel. Five chances to win gives the player pretty good odds – better than an actual game of Roulette. So if you are looking for a break from playing the real thing, take a break from the table game and try the scratch card game of Roulette out at Bovada! Can players from the United States play the Roulette scratch-off for real money? No, American players cannot play the Roulette scratch-it for real money at this time. For many online scratch ticket games that USA residents can play for real money, please visit a Rival-powered casino such as Bovada. Can I play a free flash game of the Roulette scratch game? Yes, an instant play version of the Roulette scratchie game is available to play for free or real money at Bovada. Download the latest version of Adobe Flash Player for best possible performance.